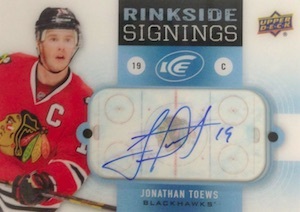 After spending the last few years as a bonus pack set-within-a-set, 2014-15 Upper Deck Ice Hockey marks the brand's standalone return. 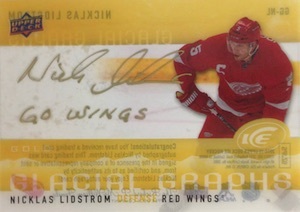 The acetate-heavy product promises one autograph, one memorabilia card and several short prints per eight-pack box. Considering there are just 24 cards per box, the 210-card set is going to be a challenge to complete. It starts with a 42-card base set. That leaves four times as many short prints. These come in various tiers, each with their own rarity. Goalies (30 cards, 1:3 packs) and Legends (12 cards, 1:7 packs) are the most common. The two subsets combine to land four per box. They come numbered to 1,249 (Tier 3, 16 cards), 749 (Tier 2, three cards) and 249 (Tier 1, two cards). 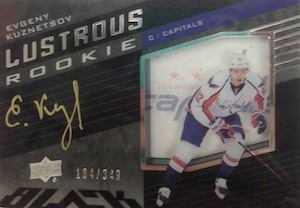 Ice Premieres rookie cards are found three per box. These come in five tiers: #/999 (Tier 5, 24 cards), #/799 (Tier 4, 36 cards), #/499 (Tier 3, 24 cards), #/299 (Tier 2, six cards) and #/99 (Tier 1, 15 cards). 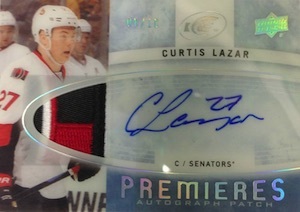 On top of the massive tiered structure, Ice Premieres have autographed (1:16) and autographed patch (#/10) versions. Glacial Graphs (1:35) continue with the acetate theme. These have inscribed Gold (1:128) and Black (#/10 or less) parallels. Rinkside Signings (1:64) use an overhead view of a rink as the signing spot. 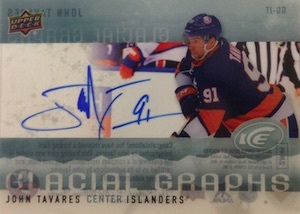 Rounding out the main autograph inserts in 2014-15 Upper Deck Ice Hockey is Signature Swatches (1:128), which add memorabilia to the equation. 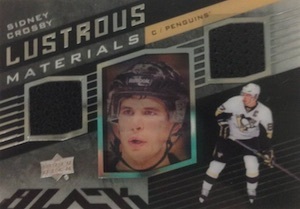 Parallels include Gold (#/10 or less) and Black (1/1). 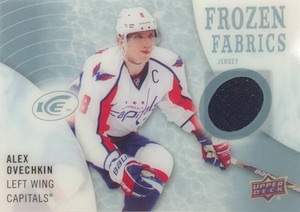 Frozen Foursomes (1:45), Fresh Threads (1:21) and Frozen Fabrics (1:21) are among the other hits in 2014-15 Upper Deck Ice Hockey. All three have numbered Gold and Black parallels. 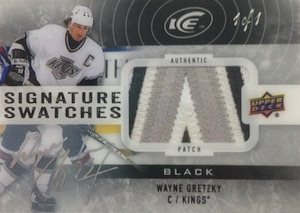 While Ice is getting its spot back on the calendar as a standalone release, UD Black is still an insert. It's high-end, but an insert nonetheless. Every box of Ice has one UD Black insert. Basic cards are numbered to 225 while rookies have 299 copies each. Other inserts with Black name include Autographed Lustrous Rookies (#/349), Lustrous Material (1:64) and Lustrous Signatures (#/99 or less). View the full Excel document for specific print runs. *Card #DB only available in the parallels. *Cards only available in the parallels. 25 cards. Inscriptions noted when available. All base players are not found in the parallel sets. View the full Excel document for specific print runs. 8 cards. Serial numbered #/349. from what I can see by looking at this page.this looks like the best product so far this year..nice !!! $134 for a box of ice where I’m at? Yah, I don’t think so. Looks like the hits are more than advertised. 3 gu and 4 rookies in my box. whats the print run on it? Knocking it down one star because both boxes had a redemption. Really? Otherwise it’s a hit. With redemptions, each box had 2 autos and 2 or 3 gu. 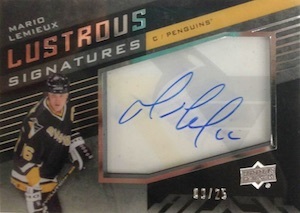 Redemptions were Shayne Gostisbehere auto patch and Johnny Gaudreau Lustrous Rookie black. This product is beautiful, every card including the base set is just nice to look at. I love that the entire base set is all league stars, well, except 1 glaring player that is not like the others.. can you spot him?? take a closer look, read through the names and tell me which stands out and clearly doesn’t belong..
Philipp Grubauer?! Who is that? Washington Capitals? But they have Braden Holtby, who started more than 70 games this season.. and isn’t Justin Peters their back-up?? So did UD just whip this set up last summer and take a guess at who will they though will make the big leagues?! It doesn’t make any sense, and it ruins the set for me. 3 stars here simply because the cards are nice and esthetically pleasing. i will NOT be investing in completing this set. I purchased two boxes at Miraj Trading in Ottawa, Canada. 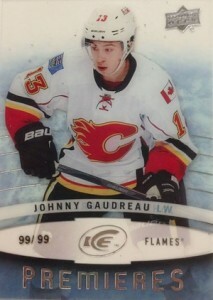 One box had a Gaudreau rookie /99 and the 2nd had a Gretzky Lustrous Materials. Both boxes were packed with other great inserts and autos. Each box had a Rinkside signings and I had a frozen foursome. Loved opening this product, by far the best this year. 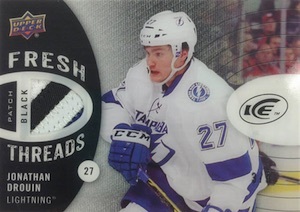 My favorite NHL product this year! Bought 2 boxes, hits were better than advertised in both. The Rinkside signings are awesome. 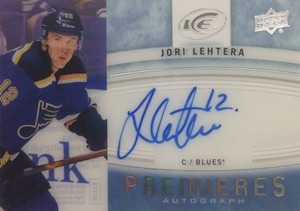 Love the base cards as well- a set well worth finishing, at least up to # 146! 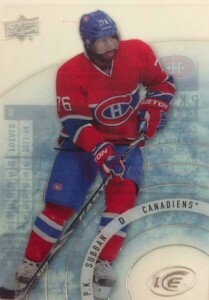 Great product, but not for the average card collector.. Way too many easy to get cards 1-84. Completing the 168 card set will be something to brag about. Trying to complete the entire set of 168 will be next to impossible. 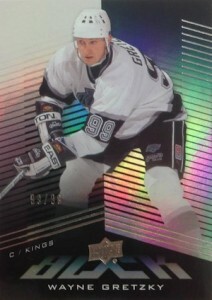 Upper Deck should have made the last 84 cards easier to find. I think it would be more interesting to have a dozen cards really short printed instead of half a set. I have had good luck with the 3 boxes I bought so far. Other than two of the lustrous rookies of Ty Rattie.